Everything gets forgotten in the fullness of time – unfortunately, this means that some torrents we’ve put out in the past that have since been neglected as well. 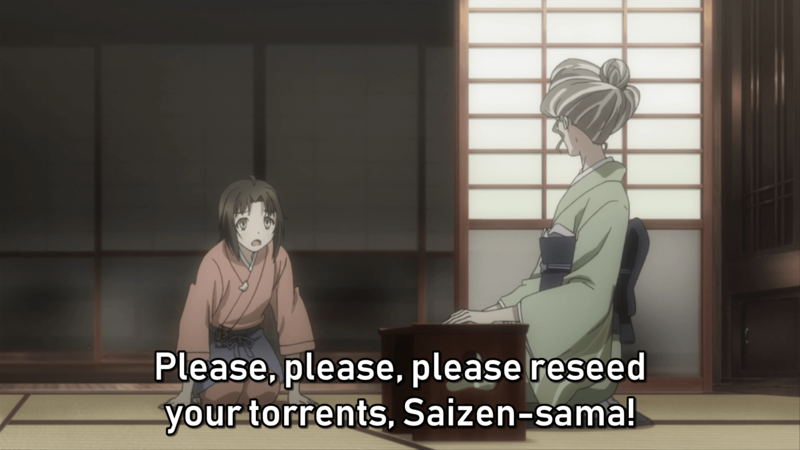 So if there are any specific Saizen torrents you wish us to reseed, tell us on this page and we will try to accommodate you if we can. Please note that reseed requests on episode releases may get overlooked, so if you want to be able to download a torrent of ours that currently has zero seeds, this is the best place for us to oblige. To view our torrents, visit our nyaa page. The list should be fairly comprehensive but if you can’t spot a project we’ve done on there and there’s enough demand for us to stick a batch torrent of it on there, let us know here, and we’ll see what we can do. PLEASE NOTE: If there is a batch or partial batch of a series, we only seed/reseed the batch, not the individual episodes. Hey I’m just asking if you can reseed the Ashita no Joe pilots for me please. They’re the only episodes I can’t download. Hello can you please reseed kuroko bd batch for both seasons in 720? Hey guys, looks like Ninku 32, 35, 36 and 38 doesn’t have any seeders. Would you be able to reseed these? Captain tsubasa 1-125 have no seeders or little seeders, can you upload a batch file if possible? Hi guys, Ninku episode 32, 35 and 38 are fine now, and I keep all of them seeded. There is still one episode (number 36) that is not completed since 1 week. It’s stucked at 80%, no more movement. I checked on nyaa, but this is the only episode with no seeders on the list. Thank you so much for your incredible work guys. Hello! If possible, can you reseed Beast Saga? I just posted a comment under the batch post before finding this section. Long story short (too late! ), I just started collecting the toys and would love to watch the show as well! Great work guys! Could you reseed Lupin III: The Hemingway Papers? Can you reseed Gundam-san, thanks and best regards. Any chance to reseed [Saizen]_Ookiku_Furikabutte_-_The_Summer_Tournament_Chapter_-_01-13_&_Special ? Thanks a lot! Hi! I’d like to ask to reseed Kuroko’s Basketball Endless Summer Fan Disc Extras [DVD]. Thank you!